An integrated communications solution built with the Liquid State Platform allows hospitals to deliver personalised content directly to their audience’s personal devices. In fact, the integrated nature of the Liquid State Platform allows content to be styled for, apps, web, and print. The Liquid State Platform is underpinned by ‘CODE – Create Once, Deliver Everywhere’ methodology. Whereby, content is created in such a way that it can be delivered across multiple channels without additional formatting. This process allows hospitals to transition from a parallel workflow to an integrated workflow as shown below. In fact, an Australian hospital made the projection that using the Liquid State Platform would reduce time spent creating and updating content by 63%. Ultimately, this allows the communications team to spend less time styling content and more time delivering value to their audience. Using the Liquid State Platform to deliver an integrated communications solution would allow hospitals to create content from a single source of truth and publish to a variety of channels without additional styling. In turn, this would allow communications professionals to save time when creating and updating content for the hospital. This is an invaluable improvement to the content creation workflow as it allows communications professionals to create and update content more effectively. We have created an online calculator to allow you to better understand the benefits of the integrated comms workflow. 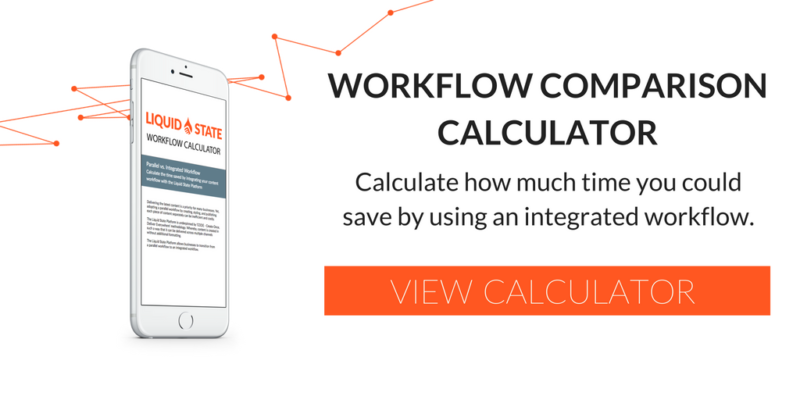 This calculator compares the two approaches and calculates the savings in time when using an integrated workflow. Access the Liquid State Workflow Comparison calculator to see how the Liquid State Platform can drastically improve your content creation workflow.